It has two entrances from the street, and a few different areas inside, though all are interconnected with no doors in between. The left-hand entrance leads into what was obviously once the public bar, complete with dartboard. The right-hand entrance leads into the main bar area, which has a flatscreen, fruit machine, quiz machine, and a mix of banquette seating and tall bar stools. A total of seven handpumps are set on the bar in three small groups, and golf trophies are displayed on the gantry above the bar. Further back from this is a restaurant area with ornate fabric tablecloths (topped with plain paper ones) and fabric flowers in vases photo, leading through to a part-paved part-grassy garden with picnic bench seating and a reasonably-sized wooden smoking shelter. Kake and Ewan visited on a Sunday lunchtime in September 2012. The handpumps were clipped for three Fuller's ales: Chiswick (£3/pint), ESB, and London Pride. A pint of lime and soda was 80p. There were quite a few people in at 1pm, including at least one toddler. The flatscreen was showing Formula One, initially with the sound off (and music playing instead: Elton John, ABBA, that sort of thing), but partway through our visit the music was turned off and the TV sound turned on. 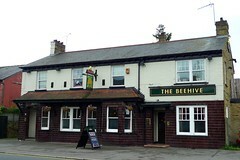 According to the Beehive website as of September 2012, food is served noon-3pm and 6pm-9:30pm Mon-Fri; 6pm-9:30pm Sat; and 1pm-5pm Sun. As well as English pub food, they also have a fairly extensive Thai menu — see photos as of September 2012: p1, p2, p3, p4, p5. Kake and Ewan tried the Thai food in September 2012. Green curry with pork (£5.50) photo was fine; the pork was very tender, and the spice level was warming but not challenging. Som tam (£4.50) photo was pretty good; spicy and savoury, with a distinct flavour of fish sauce, and not too sweet. Plain rice (£1.50) was a little mushy. Accessibility: A step to get in at both entrances. Once you're in, it's step-free to bar, all the interior seating, and the toilets. There's a ramp to the garden, but we failed to note whether there were any steps out there. Last visited by Kake and Ewan, September 2012. Opening hours taken from the 2013 Good Beer Guide. Last edited 2013-09-12 22:19:30 (version 3; diff). List all versions. Page last edited 2013-09-12 22:19:30 (version 3).